On August 12, the JH Faculty took the next step in the “Build Something Together” Project. The essence of the meeting involved a facilitated exchange of ideas that could grow and morph into realized project-based learning plans. 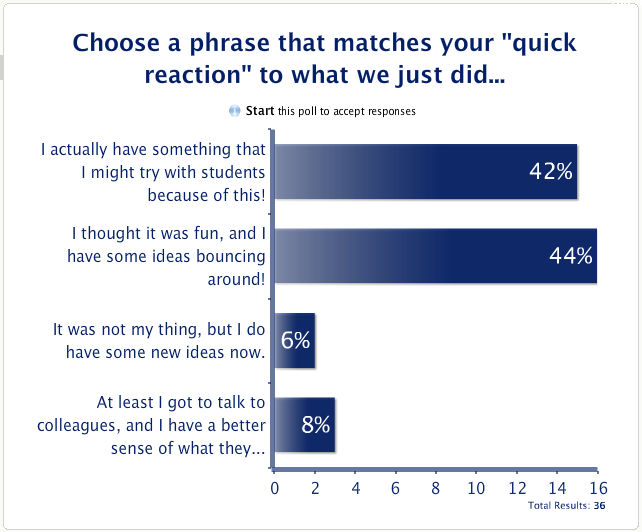 At the conclusion of the meeting, we used Poll Everywhere to establish a quick snapshot of people’s reactions to the meeting. This entry was posted in CBL, DBL, PBL and tagged 21stC, Assessment, PBL by boadams1. Bookmark the permalink.